GILAD Shalit is free. He was swapped for lots of Palestinian prisoners, some of whom had murdered. When will we see an Arab leader visiting the family of an Arab citizen arrested in Israel or somewhere else? When will we see an Arab official assuring a family that the government is doing its utmost to help secure the release of an Arab captive abroad as did Israeli prime ministers with Shalit’s family? It is quite great to see over a thousand Palestinians released from Israeli prisons, but it is very sad that this huge number of detainees will be exchanged for a single Israeli soldier. Isn’t it very humiliating for all Arabs politically and morally? It is no wonder at all that Israel is releasing a large number of Arabs for one person. It must have seen the Arab armies and security services opening fire randomly on Arab demonstrators as if they were a swarm of flies or a herd of livestock just because they went out clamouring for their basic rights. Have you ever seen an Israeli force shooting Israeli demonstrators with great ease? Of course not. In actual fact Israel sent its aircraft to Uganda years ago to help free Israeli citizens kidnapped by Palestinians there. And so, as long as we, Arabs, do not respect ourselves nobody will ever respect us, and we will always exchange thousands of Arabs for one single Israeli. All this, I fear, is simply an indication of how inured the world has become to the obscene idea that Israeli lives are more important than Palestinian lives. Netanyahu argues that he acted because he values Shalit’s life so greatly. Yet who is surprised really, to learn that Netanyahu sees one Israeli’s freedom as a fair exchange for the freedom of so many Palestinians? Likewise, Hamas wished to use their human bargaining chip to gain release for as many Palestinians as they could. They don’t have much to bargain with. At the same time, however, there is something abject in their eagerness to accept a transfer that tacitly acknowledges what so many Zionists believe – that the lives of the chosen are of hugely greater consequence than those of their unfortunate neighbours. 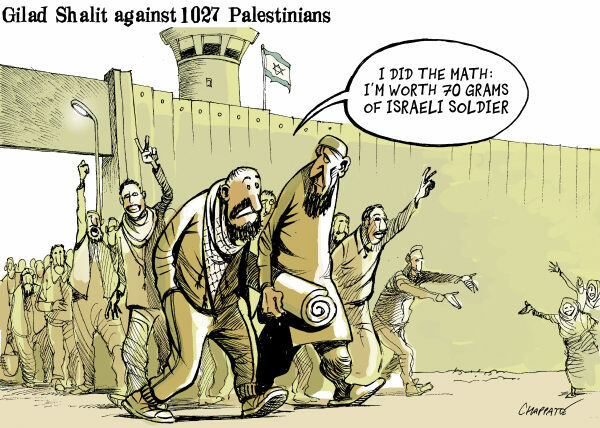 Assuming Ms. Orr is not kidding, how is it possibly Israel’s fault that Hamas demanded the release of 1,000 Palestinian prisoners in exchange for Gilad Shalit? Isn’t this a question for Hamas?